The title of this post may be a bit misleading. I’m calling these “breakfast potatoes “ when I should really call these “everything potatoes “. Seriously, you can make these as a side for breakfast, brunch, lunch or dinner and you won’t get ANY complaints or weird looks. They pretty much compliment any main dish and you can change up the flavor profile simply by changing out the herbs. In my house, I can never seem to have enough potatoes. I have two growing boys- they just Hoover through everything!! And let’s be honest- potatoes may be a perfect food. I make these at least once every weekend. I’ve been doing this for a couple years now and no one is bored with them. Some weekends I change up the herbs. Sometimes, I’ll sauté a small onion & jabenero pepper then add the potatoes (no herb medley there- just chives or green onions). If I am feelin extra sassy, I’ll top the finished breakfast potatoes with cooked chopped bacon, cheddar, and chives and pop the whole pan under the broiler until the cheese is just melted. Quite honestly, they’re a great side for anytime of day. When making these potatoes, I’m cooking for 4. I start with 6 medium potatoes. Once you’ve peeled and chopped them into large bite size pieces you should be able to fill a 4 Cup Pyrex measuring cup to the top! 6 medium potatoes like Russet, Yukon Gold, Red, or Sweet Potatoes. 6 medium potatoes (about 5 cups), peeled, rinsed, and chopped into bite size pieces. 2 tablespoons butter ( use ghee/extra virgin olive oil for Whole30/Paleo, use Vegan butter or Extra Virgin Olive Oil for Vegan). 1. On medium heat melt butter or olive oil in a large nonstick skillet . Add potatoes and all seasonings. Stir well and cover. Cook for about 8-10 minutes. 2. 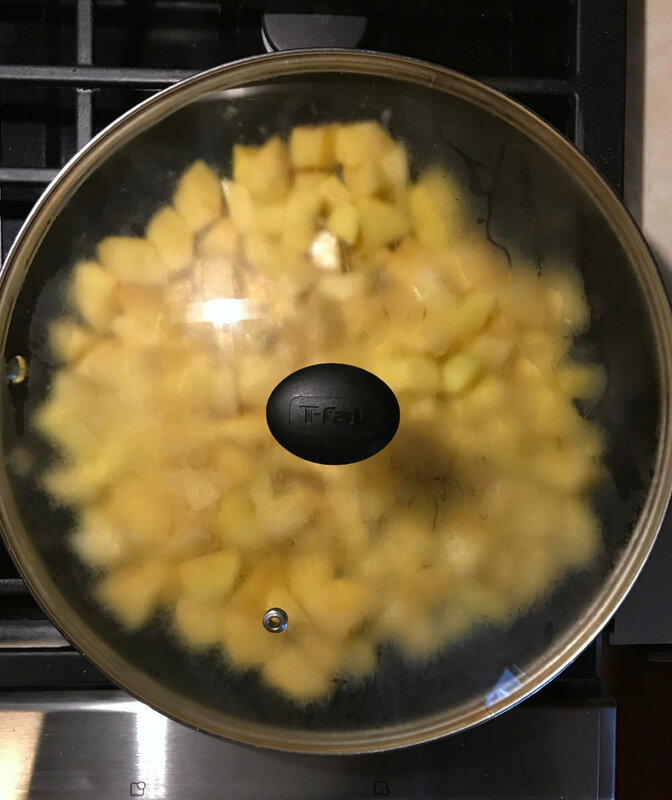 Stir once and move the potatoes around to get golden color on the other sides. Cover and cook under golden and fork tender. About 5-8 more minutes. 3. Uncover, add herbs and stir. Serve immediately.